Lot 243. The Holms Hepburn Coronation carpet, Persia, Safavid, 17th century; 245 by 216cm. Estimate 60,000 — 80,000 GBP. Lot sold 75,000 GBP. © Sotheby's 2016. Acquired in 1903 from Duveen Brothers. John Augustus Holms (1866-1938), Renfrewshire, Scotland. Charles A. Hepburn (1891-1971), Glasgow. 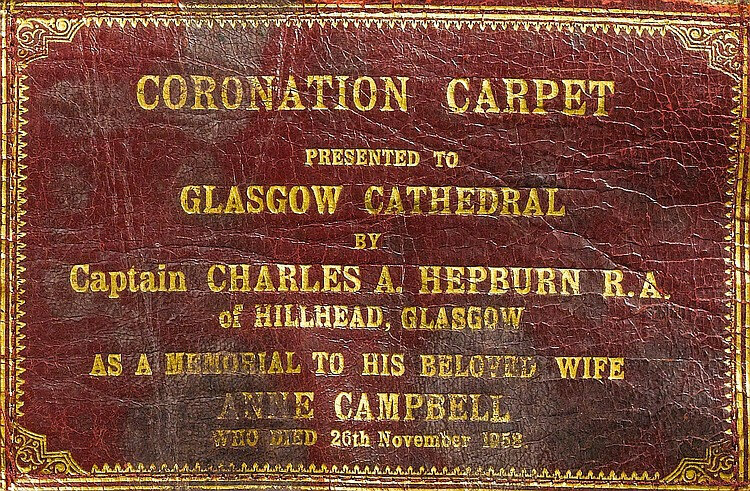 Donated to Glasgow Cathedral, 1971. 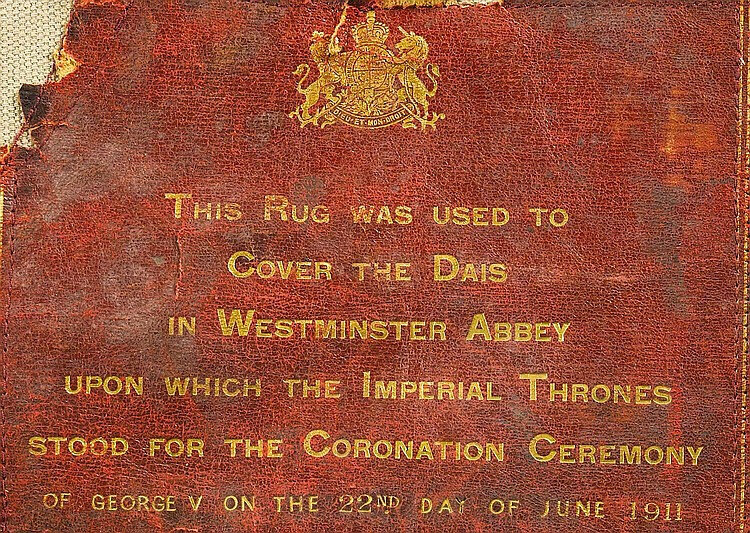 Note: Exemplifying the European taste for carpets of Safavid origin at the turn of the twentieth century, this carpet of distinguished provenance was not only used during the coronations of one, but two English Kings, Edward VII and George V, in 1902 and 1911 respectively. Comprising a highly complex network of swirling vines with curling, split and serrated sickle leaves which encircle palmettes arranged in a horizontal and angled design, the central panel of the present example, although cut-down and restored, displays the high quality of carpet designs of the Safavid era.The sickle-leaf is a Safavid motif close in style to the Ottomansaz, or curling, feathered leaf design. 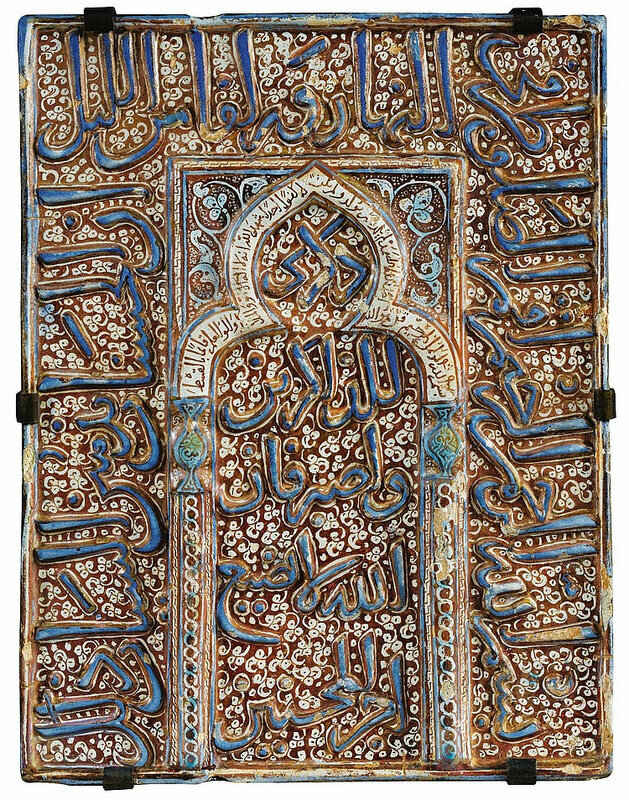 The origin of the saz is linked to circa 1550, in an album of the period which includes design elements that came to be used on a variety of media including ceramics, textiles, metalwork, book bindings, and carpets, produced by the imperial studio of the Ottoman Sultan Mehmet the Conqueror (see Michael Franses, 'The Influences of Safavid Persian Art Upon An Ancient Tribal Culture', in Heinrich Kirchheim et al., Orient Stars, Stuttgart and London, 1993, p.108). During the reign of Shah 'Abbas (r.1587–1629), the artistry of carpets flourished as royal weaving ateliers were established in his new capital Isfahan. The high-quality carpets produced in these workshops began to be exported to Europe in large quantities, and the demand continued to thrive into the twentieth century as it was the fashion for the most prevalent European families of Europe such as the Rothschilds to own carpets of Persian origin. 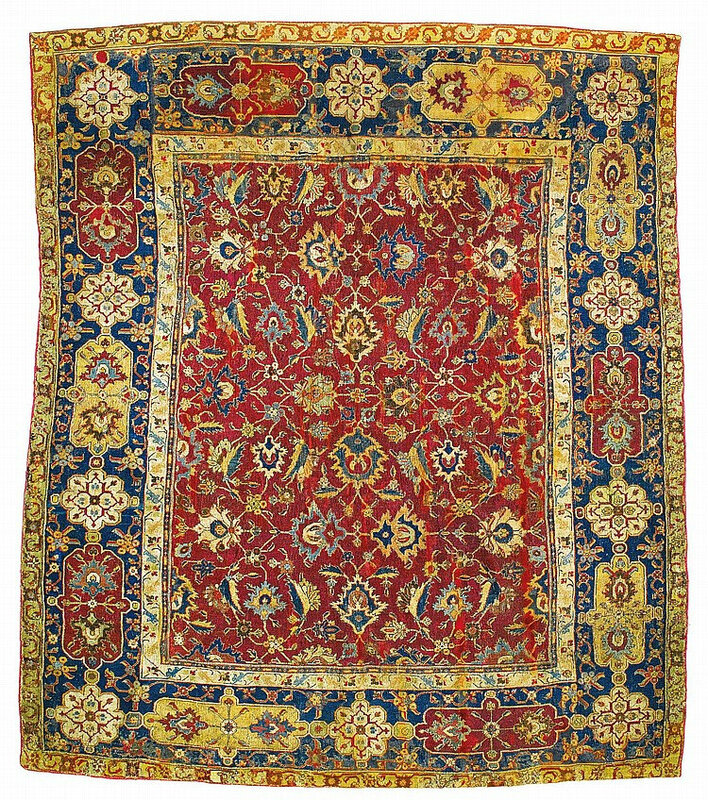 It is notable that at the 1903 auction of the Estate of Henry Marquand, the top lot was a Persian carpet and half of the top ten lots were carpets. In that year, the sales totals for decorative arts were over double those for paintings, indicating the esteem in which carpets and furnishings were held at the time. The Duveen brothers, founded by Henry Joseph and Joel Joseph Duveen in the late 1860s, were recorded as the buyers of most of the Safavid carpets appearing on the market. In turn, their influence helped to encourage collectors and drive the market upwards. Sir Joseph Duveen, who presided over the firm between 1909 and 1939, is remembered today as one of the most prominent art dealers of the twentieth century, and a dominant figure in the art market. 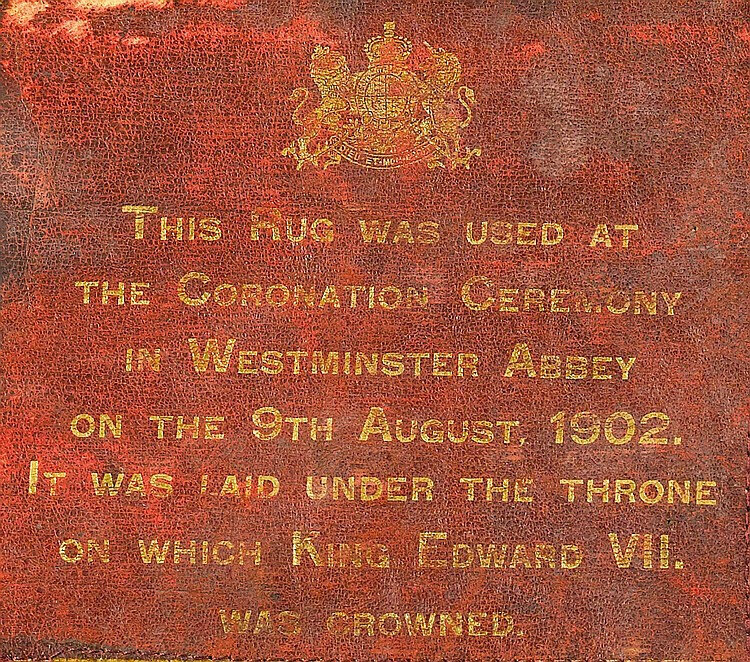 During the coronation ceremony of Edward VII, three of the carpets exhibited came from the Duveen Brothers, including the present example. This extraordinary carpet was one of the three Safavid carpets used during the crowning Ceremony of Edward VII at Westminster Abbey in 1902. Out of the other two, one is now in the Los Angeles County Museum of Art, (Gift of J. Paul Getty, 49.8), and the other was sold by Christie's London, 16 October 1997, lot 100. 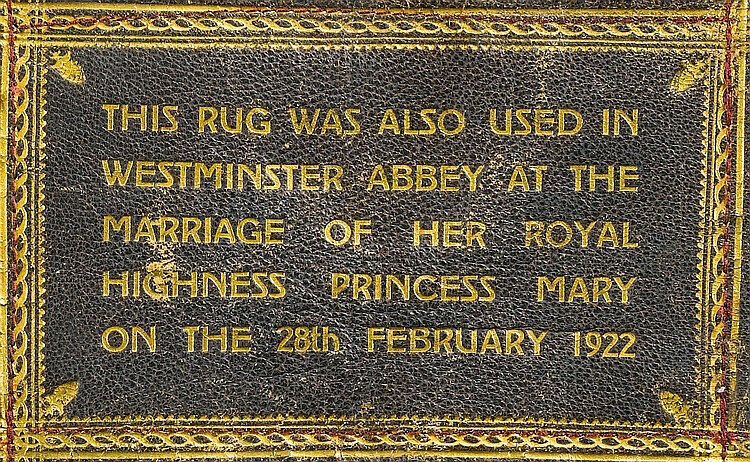 It is the only one to have been re-used for the coronation of George V in 1911, and the marriage of Princess Mary in 1922. The Safavid design featuring sickle-leaves and palmettes on a red ground is best exemplified by a carpet sold at Sotheby's New York, Important Carpets from the William A. Clark Collection, Corcoran Gallery of Art, 5 June 2013, lot 12. Sotheby's. 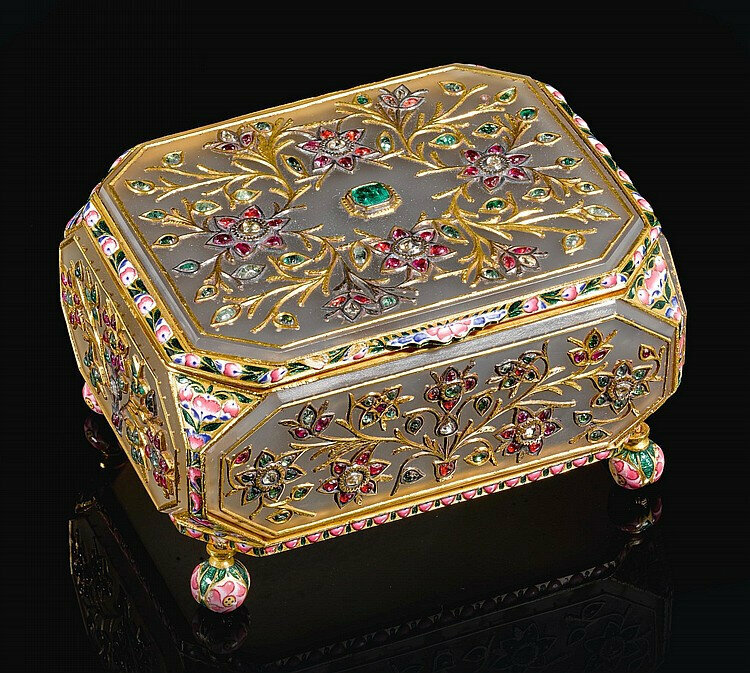 Arts of the Islamic World, London, 19 October 2016.